- Chuck Palahniuk is best known for the award-winning novel Fight Club, which was later made into a film directed by David Fincher. - Diary loosely falls into the modern horror genre, putting aside violence and shock tactics in favour of psychological scares and dark humor. - The audio version of Diary is narrated by actress Martha Plimpton. - In an interview at Sundance, Palahniuk stated "Lullaby and Diary, they have both been optioned and have screenplays, and I think Diary's closer to being cast than Lullaby." - The dust jacket of the first edition of Diary contains a hidden printed message. The inside of the jacket is printed black, with white letters printed vertically across the jacket from bottom to top, in the same style of writing as the title on the cover. They read "WHERE DO YOU GET YOUR INSPIRATION?" - Nominated for the Bram Stoker Award for Best Novel for Lullaby in 2002 and Haunted in 2005. After watching The Fight Club movie starring Brad Pitt and Edward Norton, I immediately promised my self that I would read each and every Chuck Palahniuk book. But then again promises are meant to be broken. 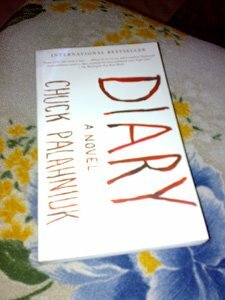 At the end of the day I wan only able to buy this one Chuck Palahniuk book and the rest was either unavailable or I was too busy to look for copies. The worst part is I haven't read this book yet. Diary takes the form of a "coma diary" kept by a Misty Marie Wilmot as her husband lies senseless in a hospital after a suicide attempt. Once she was an art student dreaming of creativity and freedom; now, after marrying Peter at school and being brought back to once quaint, now tourist-overrun Waytansea Island, she's been reduced to the condition of a resort hotel maid. 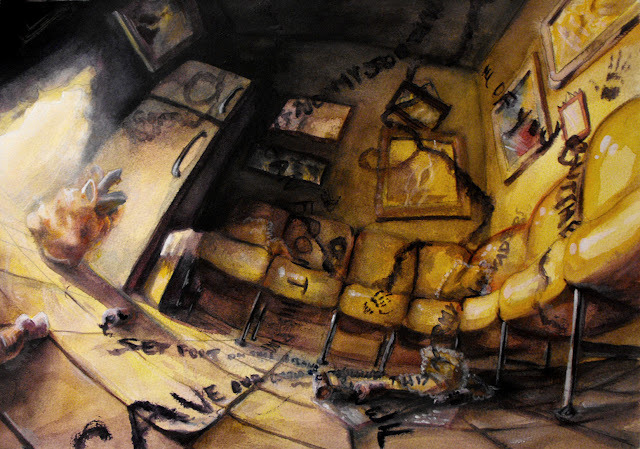 Peter, it turns out, has been hiding rooms in houses he's remodeled and scrawling vile messages all over the walls - an old habit of builders but dramatically overdone in Peter's case. Angry homeowners are suing left and right, and Misty's dreams of artistic greatness are in ruins. But then, as if possessed by the spirit of Maura Kincaid, a fabled Waytansea artist of the nineteenth century, Misty begins painting again, compulsively. Misty discovers the islanders, including her father-in-law (previously thought to be dead), are involved in a conspiracy which repeats every 4 generations. A young artist (in this case Misty) is lured to the island by old jewelry, becomes pregnant and has children. It is implied that this old jewelry works to lure and entrap her because it was hers in a past life, during which these same events played out before. During middle age, her husband dies, followed by all her children, resulting in a wave of creativity, the product of which is mesmerizing to the audience. The islanders then create an exhibition of the art work at the local hotel where a fire is started by Misty's daughter, who is revealed to be alive, and all the hotel's occupants are burned to death due to their mesmerization. The result is a huge insurance claim which leaves the remaining island citizens wealthy enough to support their luxuriant lifestyles for the next 4 generations at which point a new young artist will be found to repeat the cycle. Peter, Misty's husband, was attempting to warn her of this plot using his hidden writing and it is revealed his suicide attempt was in fact a murder attempt. It is never revealed in the end whether Peter recovered from his coma, but from Misty's descriptions of his state of health, he more than likely passed away.